A properly constructed snare can safely catch rabbits. Rabbit snares are a cheap and effective way to catch rabbits. Whether you're hunting rabbits for dinner or just trying to save your garden from a constant onslaught of rabbit thieves, the rabbit snare is one of your most effective options. Snares generally are lightweight, so you can carry many of them at once. They're ideally made of low-visibility materials, making them harder for rabbits or other hunters to see. But if another hunter does see them and steal them, snares are easy to replace. Cut a piece of stainless-steel wire about 21 inches long. Bend the wire into a small loop about 1.5 inches from one end. Using pliers, twist the wire until the loop is formed and tight enough not to come loose. If the loop comes loose, the rabbit can escape. Bring the other end of the wire through the loop. This will form the larger loop that will capture the rabbit around the neck. Form another small loop on the end of the wire you just brought through the first loop. Follow the same instructions, bending the wire about 1.5 inches from the end. Tighten the new loop so it won't come loose. Cut off enough string to suit your snare purposes. The length will depend on how you plan to set up your snare. Cut off a few extra inches to ensure the string is long enough to set your snare. Tie one end of the string to the second loop you formed. 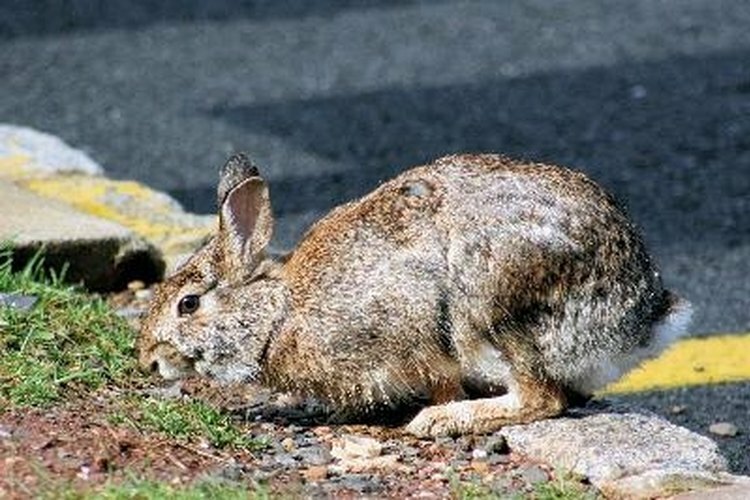 Wild rabbits can be dangerous; take care when approaching them.